Would like to own a property that you can also utilize for business other than as a private home? 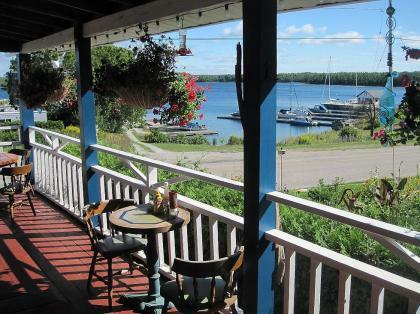 You should not let the opportunity of buying this bay-view inn and restaurant pass then. The inn and restaurant is a very welcoming and warm turnkey inn and restaurant that includes a private apartment. Our property is fully equipped, well furnished, upgraded, and comes with a viable financial record. We are always ready to provide you the best, quality service for your new journey in life. We are located on the farthest western area of Montreal since the property was constructed in 1876. We have been catering our guests with great past and present stories. While we allow guests to step back in time and be at awe to nature's wonderful offerings, we coupled it with our amenities. The Inn is composed of seven very intimate, relaxing and comfortable rooms that permit guests to feel breezes coming from the North Channel. Each of these rooms has distinct decoration that includes electric fireplaces and is fully furnished with its antiquities. A fully licensed dining room, veranda, and a parlour are also provided. The property is open for any discussion with regards to possible expansion of the property when you are interested so. We do business seasonally from the middle of Spring to Fall. This will allow the new owner to do some expansion during the season. We operate 12 pm to 2 pm for lunch and 5 pm to 8 pm for dinner. We, however, do not offer a room service. Our business employs three people who are knowledgeable and well-trained. We have been operating since 1876. Training and Support: It will guide the new owner in doing business and will support through guide book, order book, recipe book and the training time. Owner Funding: You may contact the seller for the availability of our owner financing and more. Financing Availability: The first lender will be entitled of financial assistance of up to 37% of the total value. Operation of Business: This business can be done at home. It has a 2-bedroom apartment that gives you a spectacular view of the harbour and the water. The property is situated at the farthest western part of the city. The property is in three stories with a basement. Its restaurant and parlour are on the first floor, 7 rooms on the second floor and a private apartment on the third floor. Any conversation for plans will be based on request.